“Compared to those not enrolled in clinical trials, the evidence shows that the minority patients participating in clinical trials had increased overall survival,” said Khilen B. Patel, MD, at the 2018 Society of Gynecologic Oncology Annual Meeting on Women’s Cancer. 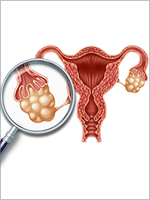 The PARP inhibitor veliparib demonstrated activity in relapsed/refractory BRCA-mutated ovarian cancer, according to results from a phase 2 trial conducted by the Gynecologic Oncology Group. Two phase 3 trials presented at the 2013 European Cancer Congress suggest that the optimal role of bevacizumab will be in high-risk patients. A new antiangiogenesis inhibitor with a different mechanism of action than bevacizumab shows promise in platinum-sensitive ovarian cancer, according to results of the phase 3 TRINOVA-1 trial presented at the 2013 meeting of the European Cancer Congress. Angiogenesis is an active area of clinical research in ovarian cancer, but proving that this approach extends overall survival (OS) has been somewhat challenging thus far. Michael Bookman, MD, reviewed studies of antiangiogenesis in high-grade serous ovarian cancer at the 2013 Chemotherapy Foundation Symposium, held in New York City. Angiogenesis is an active area of clinical research in ovarian cancer, but proving that this approach extends overall survival (OS) has been somewhat challenging thus far. Neoadjuvant chemotherapy was found equivalent to primary surgery followed by chemotherapy for patients with advanced ovarian cancer in the Medical Research Council Chemotherapy Or Upfront Surgery (MRC CHORUS) trial reported at the 2013 American Society of Clinical Oncology Annual Meeting. A list of resources arranged and provided for patients, survivors, providers, researchers and supporters in the field of Oncology. Previous trials of maintenance therapy for patients with ovarian cancer have failed to show improved survival. A study presented at the 2013 American Society of Clinical Oncology Annual Meeting is the first successful phase 3 trial in this setting—targeted therapy pazopanib extended progression-free survival (PFS) in women with ovarian cancer by a median of 5.6 months.